Let’s cut right to the chase. Most men don’t feel comfortable carrying colorfully patterned bags of any sort. You can tell them over and over again, “just please carry the bag” and explain that nobody is paying attention to the bedazzled straps or the glittery cheetah pattern, but you will get nowhere. It is instinctual and inevitable. Almost every dad is perfectly willing and capable of carrying the baby’s heavy cargo around. In fact, most dads are eager to prove how strong and reliable they are. You just have to involve them in the process of choosing the best diaper bag for dad that will fit the sensibilities of a man. In fact there are lots of different diaper bags for dads. There is no doubt that the best men’s diaper bag is a backpack diaper bag. Instead of a floral or cheetah pattern bag with one strap, have you ever considered getting a black diaper bag, a camo diaper bag for dad, or even a men’s tactical diaper bag backpack!? 5 How to choose the right diaper backpack? Doesn’t look like a diaper bag AT ALL! First thing you should know if you want dad to carry the diaper bag is that he wants to carry it like a backpack. He has worn backpacks all his life, and still uses a backpack for the gym, or hunting, or hiking, or whatever. He just doesn’t like using a single strap because it feels like a purse and is not familiar. The backpack is the key to this whole idea. 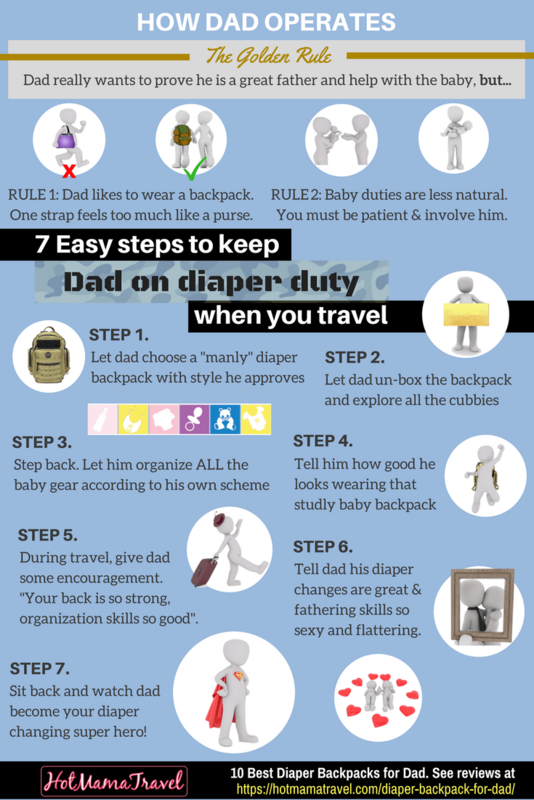 Do you want dad to change more baby diapers when you are traveling? First, help him select a male diaper bag backpack that he likes and support his decision no matter what. Remember, he is going to be carrying this thing, not you (that’s the whole key). Luckily, there are a bunch of male diaper bags to choose from (be sure to continue below to see our picks for the best overall backpack diaper bag). Next, let him un-box it and go through all the little pockets and cubbies and hidden areas for storing things. Help him discover where the diapers might fit, the wipeys, the clean clothes, the dirty clothes, the passies, the formula, the toys, etc. Try to be patient as HE discovers where certain items will fit, and then step back and let HIM pack it up the first time. It might look terrible, but whatever, let it be for now. Your goal here is to let him find his own organizational scheme that works for him. Pretty soon, without him even realizing it, travel diaper duties will become dad’s domain. He will be carrying that manly diaper backpack, and when baby has a poopy diaper, you hand the baby off so he can carry that tactical diaper backpack, organized in his distinct way, to go get that diaper changed. You don’t know where things are. It is a little too heavy for you and you need his strong back. It just looks so manly and handsome on him. Play all of these cards enough so that over time, he comes to accept that he is the man, the travel diaper changer, and I bet he will even start to become pretty proud of himself for it! We created a shareable infographic so you can save it, pin it, and share it with your friends on social media. See if it works for you!? Please include attribution to https://hotmamatravel.com with this graphic. Ok, so if you want to try this gambit, first you will need to choose one of the top backpack diaper bags. Not all dads are the same and there are actually quite a few styles of men’s travel diaper backpacks to choose from. For example, you can choose a diaper bag with neutral grey or black styling, or you can go all out with a military style tactical diaper backpack. We have done extensive research to bring you comprehensive reviews of the best diaper backpacks for dad. 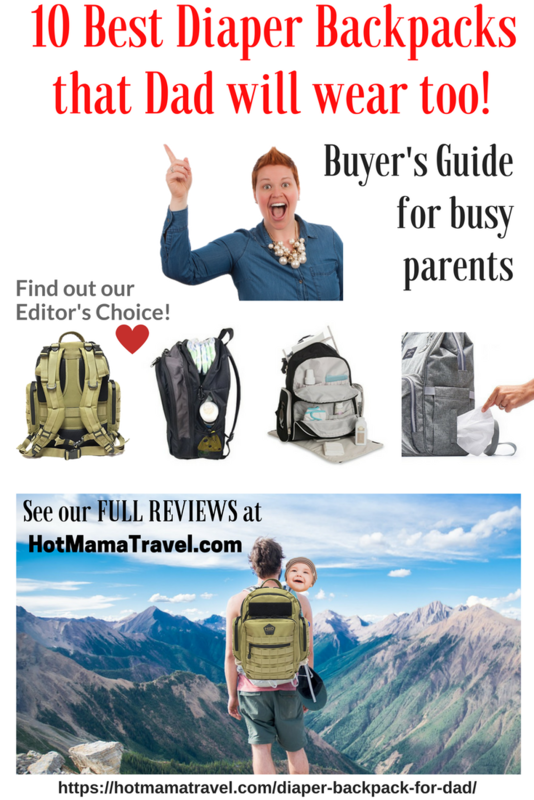 This Buyer’s Guide provides information on a broad range of diaper backpacks for any budget, listing the pros and cons experienced by real verified users and our own trusted recommendations. 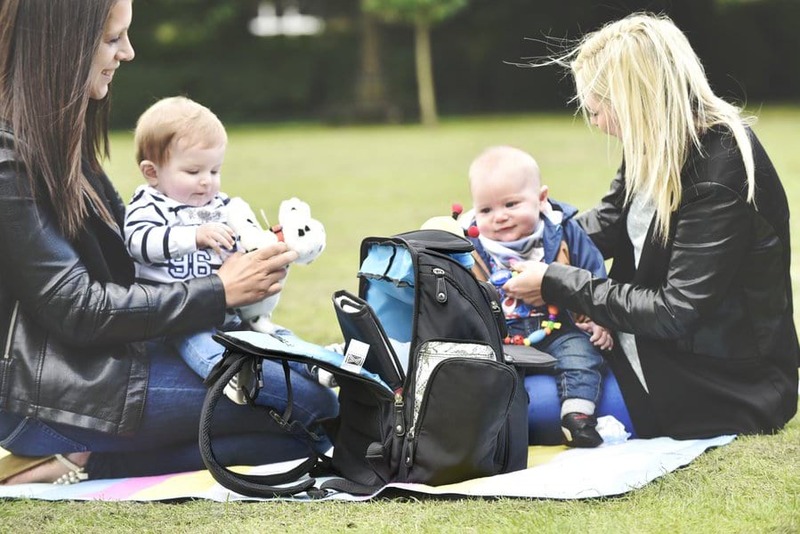 We first present a table to glance features of each diaper bag backpack, but be sure to continue reading or click the links for our full reviews. a diaper bag that dad will love. How to choose the right diaper backpack? Let’s consider what parents need in a good diaper bag? We need spacious compartments for storing large items like loads of diapers, extra clothes and formula. But we also need lots of small pockets to organize all the little things: pacifiers, baby wipes, toys, bibs, medicine, snacks, etc. We also need comfort and convenience. We want to be able to grab that diaper and wiper stat when we got a big mess on our hands (sometimes literally!). We need comfortable shoulder straps and back support. We like little extras that make our lives just a little bit easier and more efficient. Finally, we need durability so we can depend on that zipper zipping and that stitching holding tight so there isn’t one more hassle to worry about while traveling. We would like a diaper bag that stands tall on its own in the stall without toppling over onto the bathroom floor. In short, we need good design and good craftsmanship, and a little bit of style never hurts! Be careful searching online for diaper backpacks, because some sellers try to pass off extra large backpacks as “diaper bag backpacks”, when these products were not actually designed for that purpose. Such bags may work fine and fit your needs, but there is a reason that parents seek out diaper bags instead of large purses. The High Speed Daddy HSD Tactical Diaper Bag Backpack is our choice for the best overall, combining exceptional build quality, design, durability, ergonomics, and manly military styling. Best of all, this company is Veteran Owned and Operated. It has all the features you expect in a great diaper backpack but they step it up a notch compared to much of the competition. Great shoulder and back padding for extreme comfort, the zippers and seams will hold up well to daily use, and the traction feet on the bottom help prevent abrasion of the fabric and help the tactical diaper backpack stand tall at all times. With the tactical military design, you can’t even tell it is a diaper bag, and it can be re-purposed once the munchkin grows to become a gym bag or hiking backpack. In our opinion, this is the ultimate diaper bag backpack that will appeal to most dads. The KiddyCare Diaper Bag Backpack is our choice for the Best Value at it’s price point. What sets it apart is the fact that it is difficult to find any user that has any serious complaints about it! With smart design and light weight, this bag is good for mom to use on her own days out, but the styling will appeal to most dads as well. The clam shell opening allows easy access to the deep main pocket for all the big baby items, and there are 15 smaller pockets and compartments for smart organization. It also has one of the largest insulated pockets to hold up to three large baby bottles. The durable cloth is easy to wipe clean and the diaper backpack is built to last with a pretty sturdy frame. You really can’t go wrong with this one! The DadGear Backpack Diaper Bag is the choice of Ashton Kutcher, and for some fans, that may be all you need to know! Joking aside, this is a very popular and highly-rated diaper backpack for a good reason. The styling is simplistic but super practical. It has an extra-large capacity and 13 easy access compartments. What we like most is the diaper hammock at the top allows for the most seamless diaper changes. No more hunting at the bottom of the bag, and you can easily tell when you are running low. It also unzips completely flat so you can see and access everything inside more efficiently. The narrow profile helps you to squeeze through tiny spaces, making it ideal for airport or travel in busy public transit areas. 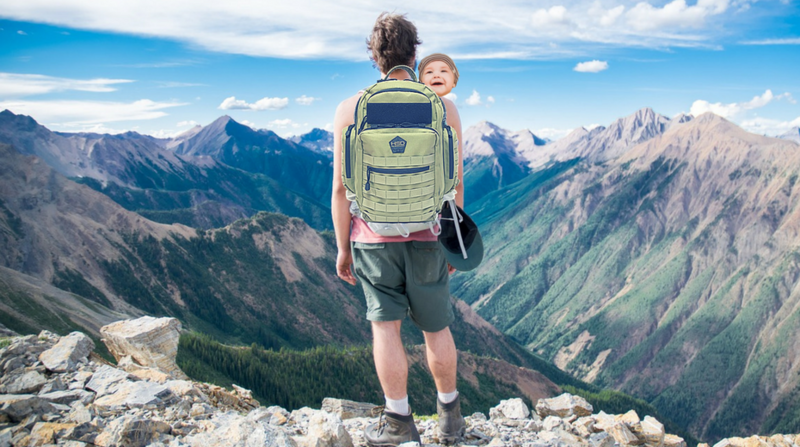 A very well-rounded and well-made diaper backpack that dad will have fun using. Vera Bradley diaper bags are popular among moms for their iconic colors and patterns, but the Vera Bradley Diaper Backpack is styled in a way that dad will likely have no problems to wear it too. The exterior of this bag is exquisite, with an embroidered diamond stitch pattern on luxurious-to-touch fabric that is also machine washable and fade resistant. The backpack is lightweight, but also smaller than others on this list, making it good for mom but a bad choice if you have gear for more than one baby. There are not as many cubbies or pocket areas, but the main compartment is large enough to fit most things you will need it to fit. The Bag Nation Diaper Bag Backpack is a true crowd-pleaser that has an impeccable ratings history on major review sites. At publication, Amazon shows 4.8 stars with over 1200 reviews, with 96% recommending this diaper backpack with at least 4 stars. Bag Nation has created a super durable backpack with strong zippers, no-fray stitching, and water resistant polyester outer fabric. It comes with 14 different pockets to help with organization and a dedicated wipes pocket for quick access when things get out of hand. Finding items is basically a breeze with the many multi-size compartments. This diaper backpack is also large enough for multiple babies or long-distance travel. The Graco Gotham Smart Organizer System Baby Diaper Bag Backpack gets the job done at a good price point. It has all the features you need in a baby diaper backpack including padded adjustable shoulder straps, large interior pocket with multiple smaller storage compartments, a side pocket for easy wipes access, and insulated bottle pocket. The design is simple and functional, but build quality leaves a little to be desired by comparison to some competitors. The JuJuBe Onyx Collection Be Right Back Backpack Diaper Bag is treated with Teflon on the outside to prevent stains, and Agion on the interior to prevent growth of odor causing bacteria. Now that is SMART DESIGN, and helpful! This backpack is one of the most comfortable to wear due to its smaller size, padded back panel with breathable mesh, and ergonomic softly padded shoulder straps. Even the baby will enjoy comfort with a memory foam changing pad included! As you would expect of a diaper bag backpag at the top of the price range, Ju Ju Be uses high quality fabrics and materials that will stand up well to daily use. The Be Right Back diaper backpack also has a special “mommy pocket” with soft lining for sunglasses, wallet, keys, whatever you need it for. The Jeep Perfect Pockets Baby Diaper Bag Backpack is well-styled and will get the job done…it just isn’t quite as dependable as an actual Jeep. Many users complain of the zippers breaking early and often, making this one a potential hassle while traveling. Nonetheless, this backpack features 12 roomy pockets including insulated side bottle pockets, as well as a spacious main compartment for larger baby items. It includes a hard baby wipes case and a gray changing pad. The Fisher Price Fastfinder Backpack Diaper Bag is really nothing special above the competition, but it does everything pretty well for the price. It does include a so-called “Fastfinder” system that allows you to organize things and find them more quickly. It comes with a changing pad, a case to hold the wipes, plastic feet on the bottom to help the back stand on its own, insulated bottle pockets, and padded shoulder straps. Overall, this is a good backpack for a decent price. The Skip Hop Duo Signature Carry All Diaper Bag Backpack has a basic style that should please dad, and ample room to carry all the baby essentials. It has 9 different pockets for organization, a d-ring on the outside to hold toys or pacifiers, and a cushioned changing pad. The fabric is durable and liquid resistant, making it rather easy to clean. 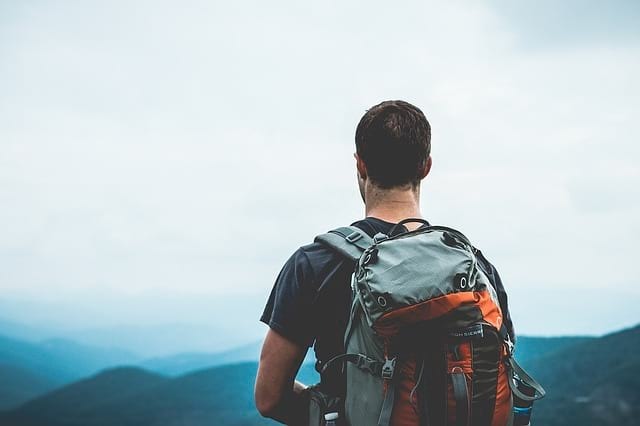 In terms of quality and design, there is nothing about this backpack that makes it stand out from the crowd, and you can probably find better value on this list. If you are looking for a diaper backpack for dad, you really can’t go wrong with any of the diaper bag backpacks on this list. We recommend buying from a Veteran-owned company and getting the HSD Tactical Diaper Backpack, which is also one of the most durable and functional choices overall according to our research. If you plan to travel often with your child outside the home, then I think a diaper backpack is a must-have. And if you involve dad in the process of choosing and organizing the backpack, then I expect that he will start to take on more diaper duties when you are out-and-about, which is good for everybody! In the comments, please let me know if you have tried this strategy yourself and whether it worked well for you or not in getting dad more involved in diaper changes. Everybody is different, so it may not work for everybody, but still, I think it is worth sharing and definitely worth a try. I looked it up and that backpack looks cool. Best of luck getting it kick started and to market, and thanks for sharing! Great suggestion. I put the measurements on the mom diaper backpack, I’ll add the daddy ones asap.